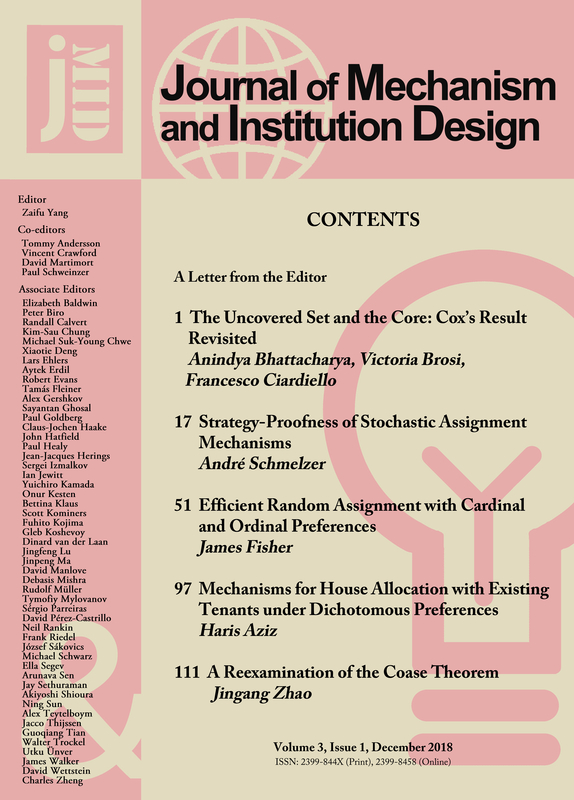 The Journal of Mechanism and Institution Design is published by the Society for the Promotion of Mechanism and Institution Design based at York, UK, and has its official identity ISSN: 2399-844X (Print), 2399-8458 (Online), and DOI: 10.22574/jmid. Publication is free of charge and articles are open-access to everyone. 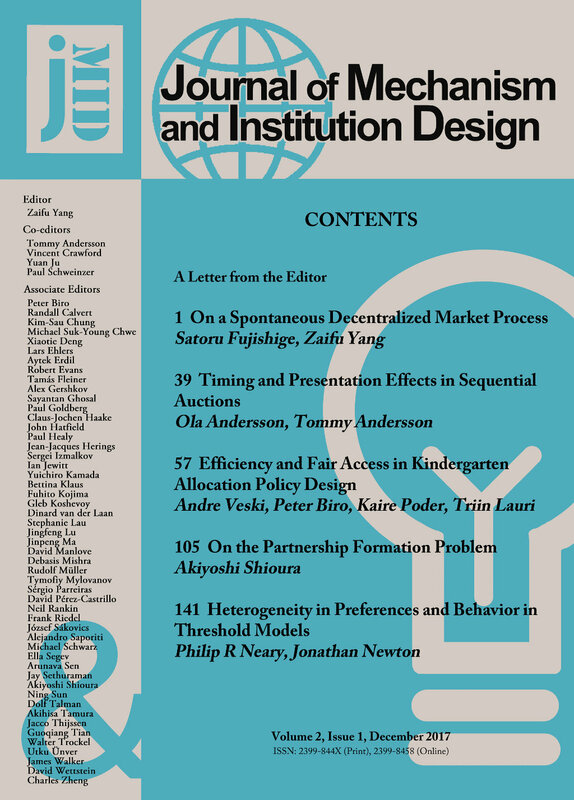 The Journal of Mechanism and Institution Design aims to publish original articles that deal with the issues of designing, improving, analysing and testing economic, financial, political, or social mechanisms and institutions. It welcomes theoretical, empirical, experimental, historical and practical studies. It seeks creative, interesting, rigorous, and logical research and strives for clarity of thought and expression. We particularly encourage less experienced researchers such as recent PhD graduates to submit their work to the Journal and are sympathetic towards those papers that are novel and innovative but which, being outside the main paradigms, have been unsuccessful elsewhere. We hope that the published articles will be interesting and valuable to a broad audience from the areas of economics, finance, politics, law, computer science, management, history, mathematics, government, and related disciplines. The journal is an open-access, independent, peer-reviewed, non-profit, English-language journal with the purpose of disseminating and sharing the latest knowledge and understanding of the subject widely. Users have the right to read, download, copy, distribute, print, search, or link to the full texts of the articles in this journal. 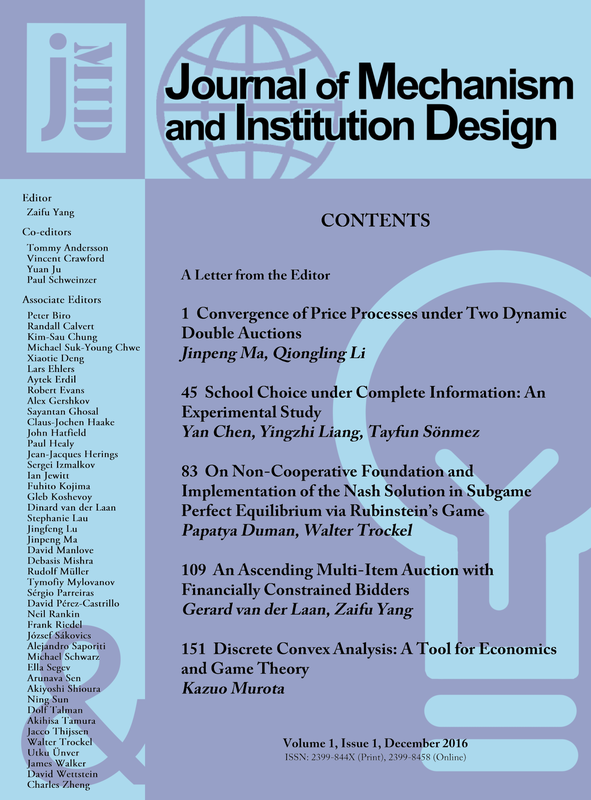 In order for any work that is published by the Journal of Mechanism and Institution Design to be freely accessible to the widest audience possible, when a paper is accepted by this Journal for publication, its author(s) will be asked to release the paper under the Creative Commons Attribution-Non-Commercial license. While the authors retain the copyright of their published work, this license permits anyone to copy and distribute the paper for non-commercial purposes provided that both the author(s) of the article and the Journal are properly acknowledged. For details of the copyrights, please see the "human-readable summary" of the license. For further information, please contact Tommy Andersson, Vincent Crawford, David Martimort, Paul Schweinzer, or Zaifu Yang. For news & updates, follow @jMechInstDesign. Designing Mechanisms and Institutions that Promote Efficiency, Equality, Prosperity, Stability and Sustainability in Society.